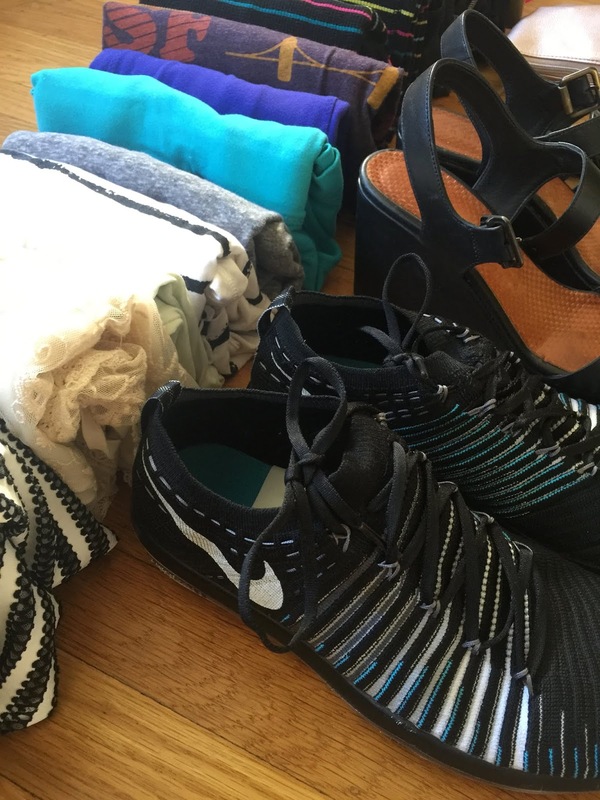 Before I completed Marie Kondo's KonMari Method of tidying up, I loathed packing for vacation. So much so, I would typically wait until 30 minutes before leaving for the airport to shove everything in a bag and fingers crossed, I would remember my toothbrush. But now that I am a convert for this organizational method, I've applied the same minimalist principles to my packing, and I'm never looking back. Here are some of the key takeaways so you too can pack joyfully. Start with a suitcase that sparks joy. During my tidying process, my parents actually got rid of my suitcases accidentally, but I took the opportunity to invest in a new set of ultra-lightweight, rolling suitcases in my favorite color: teal. Before I start packing, I unzip the bag, lay it flat on the floor, and check all pockets for possible remnants from the previous trip (usually cell phone chargers, etc.). 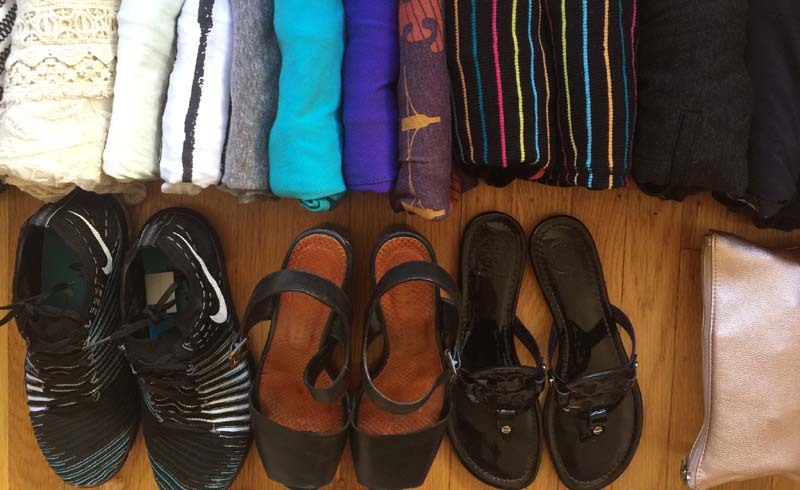 Fold your clothes the KonMari way. Most of us learned to fold our clothes into thin rectangles and stack the items on top of one another vertically. The problem with this method is you always end up rummaging around your drawer (or in this case suitcase) looking for an item and leaving the whole thing a tangled wreck. Marie Kondo suggests rolling clothes in sort of a triangle shape that stands upright by itself. The clothes are then placed side-by-side horizontally, hugging one another. This makes it so that you can see every single item you own. This is especially helpful when packing, because you can quickly see if you've forgotten something essential, i.e. underwear. When traveling, gone are the days you have to unload your whole suitcase to find that dang pair of PJs that found its way to the bottom of your bag. When packing, I go the extra mile and refold the clothes so they fit my suitcase perfectly. Then, I lay everything out on my bed (or the floor) until it's time to transfer to the suitcase. Pull out shoes and accessories. The KonMari Method is about asking yourself, "What sparks joy?" but when it comes to traveling, I ask myself, "What do I really, really need?" Oftentimes I'll end up putting away a couple of pairs of miscellaneous shoes or dresses and paring down to the bare minimum essentials, so I can zipper my suitcase without the expansion. That way, I know I have some room to spare to pack souvenirs during my trip. I leave a hole in the suitcase for my toiletry bag. Meanwhile, I gather my essential toiletries and keep them in plain view on a bathroom counter so I can use them until the last minute. Placing all of the items in a horizontal row (like your clothes) also helps you do a mental checklist before packing them away. Now that you're all packed up, remember to keep things tidy as you travel! I stash my dirty clothes (still folded) on one side of my bag away from the clean. For whatever reason, this also helps make unpacking a lot easier. You can toss all the dirty clothes in a hamper while transferring the clean, folded clothes back to your drawers.